Estacada children will soon gather for an egg-citing tradition. 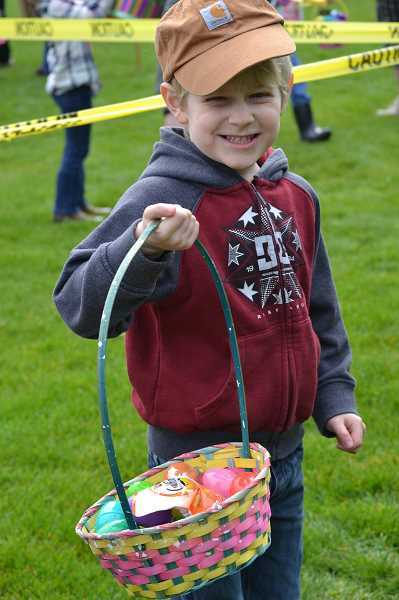 The Eastacada Rural Fire District's Volunteer Association will host their annual Easter egg hunt at 11 a.m. Saturday, April 20, at the Estacada Football Stadium, 500 N.E. Main St. The free event is open to toddlers through children in third grade. The field will be divided into sections by ages, and there will also be a section for children with disabilities. Members of the volunteer association noted that 4,000 eggs are set in the field. "It's 10 hours of preparation, and it's gone in 60 seconds," said Connie Redmond. "There's very little left on the field." Donations will be accepted through April 20. For more information, contact Redmond at 503-819-5339.